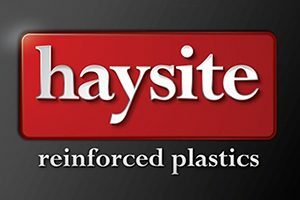 Haysite Thermalate® grades are compression molded, glass mat reinforced polyester laminates. Haysite Thermalate materials are engineered to offer superior energy efficiency, temperature control, and durability for high temperature mold and platen insulation. Their physical properties include: high heat resistance, high compressive strength, low thermal conductivity, low moisture absorption, and exceptional durability. Thermalate® machines easily and provides more precise temperature control and thermal uniformity to minimize or eliminate “cold spots” in a mold. H320 Haysite Thermalate is a tough and durable composite with high compressive strength and resistance to oil and fluid absorption. Recommended for use in operating temperatures up to 450 F, this material used as press insulation will result in energy and maintenance savings. Standard color is brown. H330 Haysite Thermalate is a thermoset insulation material with exceptional property retention at operating temperatures up to 550 F. Demonstrating superior compressive strength at high temperature, this grade provides extended use and greater maintenance and energy savings. Standard color is orange. Thermalate® is available sanded to a tolerance of + or – .002. Available in thicknesses from 1/4″ to 2″ and 7mm to 25mm and sheet size 36″ x 72″, 48″ x 60″ and 48″ x 96″. Special thicknesses up to 2″ and custom cut to size panels can be ordered. Minimum quantities may apply. *Unless otherwise indicated, all properties published are based on tests performed on standard ASTM test samples and according to ASTM test methods. Values shown are for test samples made from production materials and they are believed to be conservative. No warranty is to be construed, however. In fabricated or molded form, parts may vary considerable from this standard test data. Where specific or unusual applications arise, test should be made on actual parts, and test procedures agreed upon between Haysite Reinforced Plastics and the customer.